Scientists are developing a portable technology that will safely and quickly detect nuclear material hidden within large objects such as shipping cargo containers or sealed waste drums. The researchers, led by Berkeley Lab scientists, have been awarded over $10 million from the Department of Energy's National Nuclear Security Administration (NNSA) Defense Nuclear Nonproliferation R&D Office to combine the capabilities of conventional building-size research instruments with the transportable size of a truck for security applications on the go. The core of the detection system is a next-generation source of high-energy photons, often referred to as X-rays or gamma rays. The technology will combine the capabilities of conventional building-size research instruments, such as Duke University's High Intensity Gamma-Ray Source (HIGS), which precisely control the energy (or color) of the photons generated to improve sensitivity, with the compact size needed for use in most national security applications. The problem with current techniques, such as those used by HIGS, is that there are only a few ways to produce megaelectron-volt (MeV) photons—high-energy photons at energies a million times higher than visible light—within a narrow spread or range of energy, and those usually require an electron accelerator the size of a large building. The compact photon source, which is being developed by Berkeley Lab, Lawrence Livermore National Laboratory, and Idaho National Laboratory, is tunable, allowing users to produce MeV photons within very specific narrow ranges of energy, an improvement that will allow the fabrication of highly sensitive yet safe detection instruments to reach where ordinary passive handheld sensors cannot, and to identify nuclear material such as uranium-235 hidden behind thick shielding. "The ability to choose the photon energy is what would allow increased sensitivity and safety. Only the photons that produce the best signal and least noise would be delivered," explains project lead Cameron Geddes, a staff scientist at the Berkeley Lab Laser Accelerator (BELLA) Center. The key to making the new compact photon source tunable within a narrow energy spread lies in colliding the high-quality electron beams obtained by the BELLA Center with a separately controlled laser known as a "scattering laser." The collision with the fast-moving electron beam up-shifts the energy of photons from the second laser, producing high-energy photons, all with the same energy within a range of around 10%. 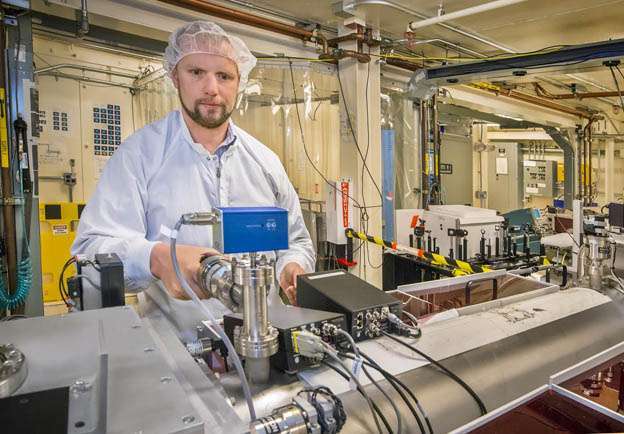 To make a tunable photon source that is also compact, Geddes and his team will use one of BELLA's laser plasma accelerators (LPAs) instead of a conventional accelerator to produce a high-intensity electron beam. By operating in a plasma, or ionized gas, LPAs can accelerate electrons 10,000 times "harder" or faster than a conventional accelerator. "That means we can achieve the energy that would take tens of meters in a conventional accelerator within a centimeter using our LPA technology," Geddes says. To make a source that can be truly portable, the team has recently demonstrated that a second compact LPA can be used to bring the energy of accelerated electrons back down. Decelerating the electron energy through another LPA could significantly reduce if not eliminate the expense, square footage, and weight required for safety shielding. Controlling the collision between the laser and electrons will similarly help reduce the size of the lasers required. This photon source will be the first to combine deceleration and an independent scattering laser in a compact design. In addition to bringing the precision of current large-facility photon sources to small laboratories and eventually into the field, the project will lay the groundwork for a very bright laser-driven photon source within an even narrower energy range. To meet the needs for national security applications, the future system will fire pulses of photons thousands of times per second, delivering up to trillions of photons per second. Such accelerators are being developed by the DOE's Office of Science, High Energy Physics (HEP), for future particle colliders, and this photon source is a near-term application that exemplifies HEP's stewardship of accelerators dedicated to the broad needs of discovery science and society. "We are very excited about this project," says Wim Leemans, Director of the Accelerator Technology and Applied Physics Division and the BELLA Center. "It has the potential to be the first major application of laser plasma accelerator technology that has been supported for many years by the Office of High Energy Physics at DOE." The technology's better signal and less harmful radiation dose could also benefit other fields that currently use X-ray machines—from lower-dose, higher-precision computed tomography (CT) scans in medicine, to detecting mechanical or structural weaknesses in an engine or airplane wing before it fails, or locating hidden explosives. Smaller and cheaper particle accelerators?